While Inoue Momota's comic adaptation of The Illusionary Conqueror, Zorro'ark is very close to the source material, there are a few differences between the two. The purpose of this page is to highlight those differences. All images of the movie are taken from either the trailers (made available on the movie's official website) or from the The Illusionary Conqueror, Zorro'ark pamphlet sold at movie theaters. High quality DVD screenshots will replace the scans sometime after this December. Two of the characters featured in the movie have not appeared in the comic adaptation at all. The first character MIA is Proof, a young girl voiced by Nakagawa Shouko. She only got about 90 seconds of screentime in the entire film, so Ms. Inoue probably found no reason to include her in the comic version. The other missing character is Tomo, an elderly woman who runs a flower shop in Crown City. She also has a Mojumbo. 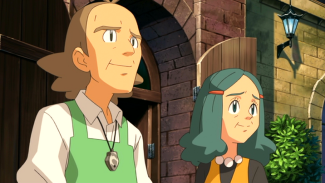 The only other thing worth mentioning about her is the fact that she is the one who initially spots Celebi in Crown City, a role taken by Jou in the comic version. 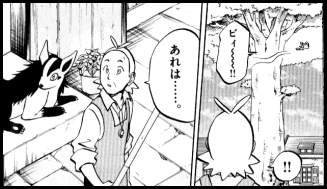 A number of pokemon are missing from the comic adaptation as well. 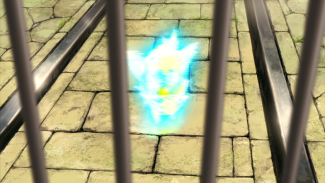 When Zorroa finds itself surrounded by Yarukimono, Satoshi sends out his Goukazaru and Hikari sends out her Mammoo to fend them off; in the comic, only Satoshi's Pikachu is used. Togekiss' role in the battle at the big tree is omitted from the comic as well, partly because Pikachu and Potchama aren't there (more on that later). At a later point in the story, Takeshi calls out his Gureggru and Usokki to fight Goon's two Hassamu in the movie but only calls out his Gureggru to fight Goon's one Hassamu in the comic. 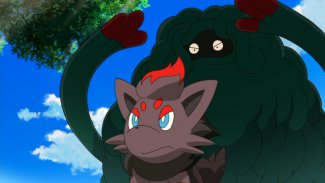 The legendary beasts of Jouto are pretty much ignored in the comic as well, but I'll get to that later. Well, it wouldn't want to get in the way of the plot, now would it? When Kohdai has Zorroa kidnapped in front of Zorro'ark's eyes, an electric wave takes over Zorro'ark, preventing it from going after its pre-evolved form. In the comic, however, these electric attacks are not present, and Zorro'ark just kind of stands there and watches as Zorroa is taken away. Zorroa transforms a lot more often in the movie than it does in the printed version. 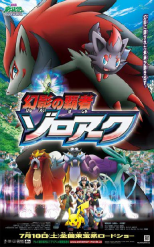 Zorroa transforms into Hassamu, Popokko, Yarukimono, Pikachu, and Celebi in the movie. It also transforms into Satoshi, Takeshi, and Hikari on multiple occasions. Whenever it transforms into a human, its fox tail remains (a reference to the kitsune on which Zorroa is based) and its eyes resemble those of a fox. A quick tug on its tail causes it to revert back to its original form. 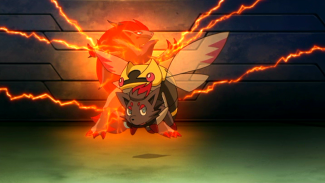 Zorro'ark, on the other hand, only transforms into the three beasts and, at the end of the movie, Pikachu. Most of this is removed from the comic. In that version, Zorroa only transforms into Pikachu, Celebi, Satoshi, and Kurt. Zorro'ark, on the other hand, only transforms into the three beasts. Most of these transformations were quick gags that didn't really affect the plot in any significant way, so their omission from the comic didn't adversely alter anything. Kohdai's holograms are truly outrageous. Truly, truly, truly outrageous. The use of holograms, fake imagery, and 3D projections vary depending on what you're looking at. In the movie, for example, Goon is ordered to recapture Zorro'ark after it's finished driving everyone out of Crown City. The bodyguard accomplishes this by sending out a hologram of Zorroa. Zorro'ark mistakes the robot for the real thing and drops its guard, enabling Goon to swoop in and trap Zorro'ark inside an electrified cage. This deceit is not present in the comic; instead, Goon just catches Zorro'ark as it wanders around on its own. Another discrepancy between the two versions occurs in the middle of the movie after Satoshi and his friends have entered the city. In the printed version, Kohdai appears in front of Satoshi and explains how he doctored the footage of Zorro'ark's rampage before broadcasting it to the people of Crown City. Satoshi tries to grab him, but when he passes through his body, he realizes that the person they're talking to is merely a hologram. 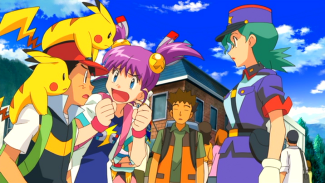 Hologram Kohdai then warns Satoshi and his friends to leave the city and not to interfere with his plans. This warning is issued in the movie version, but Kohdai does it in person after Goon captures Satoshi and the others a bit later. In the middle of the movie, Zorroa is sleeping inside Jou's house. The circumstances that brought everyone to the house are different in both versions. In the comic, Jou approaches them in the street and invites them in. In the movie, Jou's Guraena and Tomo's Mojumbo see Zorroa mischievously attacking a TV monitor broadcasting Kohdai's image. They perceive it to be a threat, so the two pokemon gang up on it and attack. Eventually, Mojumbo puts Zorroa to sleep with Sleep Powder. The conversation that takes place inside Jou's house is more or less the same in both versions. The two split off again, however, once Zorroa leaves to go chase after its Maa. In the movie, Zorroa runs toward a park. It squeezes through an opening in a fence too small for any of the humans to fit through, so Pikachu and Potchama are sent ahead while Satoshi and the others look around to find another way in. When the two pokemon catch up with Zorroa, they find it surrounded by many of the pokemon who live in Crown City. Presumably, they all feel that Zorroa, being an outsider, is responsible for the chain of events that have taken place in their city. Pikachu and Potchama try to calm everyone down, but their efforts are in vain. Just as all seems lost, Celebi appears! The time traveling pokemon makes Berries appear and hand them out to the pokemon, which calms them down for some reason. Since Celebi doesn't seem to be agitated by the intruders, the other pokemon begin to stand down. Zorroa takes on Celebi's form as a joke and then explains that it isn't able to fly even when it takes on the form of a pokemon who can. Pikachu and Potchama are eventually led out of the park by Celebi. 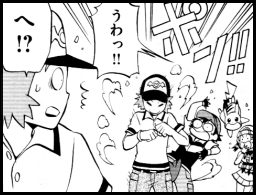 Satoshi and his friends, who have been spending this whole time running around the park's perimeter, apparently, are about to follow behind their pokemon when Goon and Kohdai appear and seal them up inside a giant crate. Everyone is taken to Kohdai's flying boat, sans pokemon. In the comic, this little adventure in the garden doesn't happen. Instead, Zorroa runs off on its own and accidentally falls into a river. 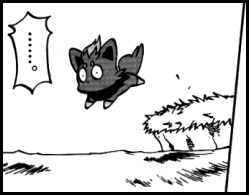 As it floats away, Celebi appears out of nowhere and pulls it to safety. Zorroa takes on the form of Celebi, just like it does in the movies, but it doesn't say anything about not being able to fly. After Zorroa declares that Celebi will be its friend, the fairy pokemon takes Zorroa to the giant tree on the outskirts of Crown City. Pikachu and Potchama are with their trainers the whole time. I guess Ms. Inoue didn't feel like the bond that Zorroa had with Celebi wasn't strong enough in the movie, so she created a situation where Zorroa's life was saved by the fairy pokemon instead. Zorroa's, Pikachu's, and Potchama's adventures continue as Celebi takes them to a giant tree. The pokemon play around for a bit before they're interrupted by Kohdai. His Kagebouzu attacks Pikachu and Potchama, knocking them off the tree. Luckily, the pokemon are able to grab onto a branch on their way down. They spend the remaining of the fight dangling from the branch, unable to pull themselves up. 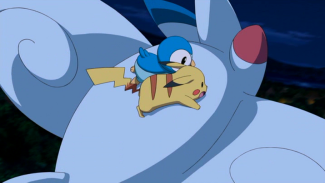 After Zorroa is knocked down, Pikachu and Potchama finally manage to climb their way back onto the tree. As soon as they do, however, Goon's Hassamu appear before them and knock the two pokemon off again. As they fall toward the ground, Hikari's Togekiss swoops in and saves them from certain death. 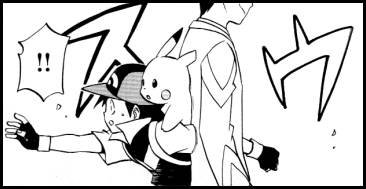 In the comic, Pikachu and Potchama are with their trainers the whole time. One million nerd points to anyone who gets the reference being made in the header's title. Anyway, in the comic adaptation of the Zorro'ark movie, the big battle between Zorro'ark and the three Jouto beasts is removed entirely. In the movie, the three beasts show up in Crown City right around the time Zorro'ark frees itself from Kohdai's flying boat. After they destroy Kohdai's ship (a task performed by Zorro'ark in printed form), they all start to gang up on Zorro'ark. After a bit of battling, injected at regular intervals for the next part of the movie, Zorro'ark finds itself surrounded. 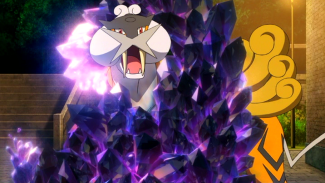 To escape, it uses its powers to create crystals that surround the legendary pokemon. 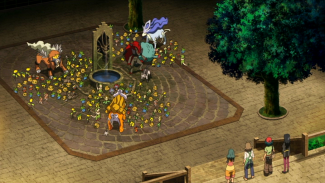 The crystals emerge from the mouth of a fountain and snake their way around the pokemon, preventing them from moving. 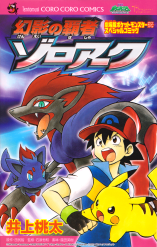 By this point in the movie, Satoshi, Hikari, and Takeshi had all taken off for the Pokemon Baccers stadium. This leaves Kurt, Rioka, Jou, and Tomo to take care of the fighting between Zorro'ark and the three beasts. When they arrive on the scene, Rioka uses her Illusion Canceller to make Zorro'ark's crystals disappear. Jou's Guraena also manages to get an attack in on Zorro'ark, for some reason. 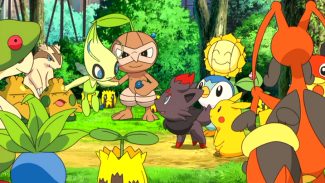 As the legendary beasts try to figure out what just happened, all the pokemon who had approached Zorroa, Pikachu, and Potchama earlier begin to surround the four combatants. 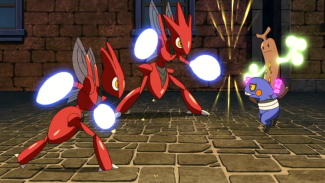 The legendary beasts see that the pokemon of Crown City defending Zorro'ark, presumably because its pre-evolved form received Celebi's seal of approval earlier in the movie, and decide that Zorro'ark is not their enemy. The fox pokemon is allowed to leave in order to track down Kohdai. The comic version cut all of this out, giving the illusion (get it?) that the actual legendary beasts weren't going to be playing any significant roles in the film. They do show up at the end of the graphic novel version, but the removal of this battle makes the whole thing come off as even more of a deus ex machina that it does in the movie. People don't Koh-die in Pokemon movies! What ends up happening to Kohdai at the end of the story depends on which version you're looking at. 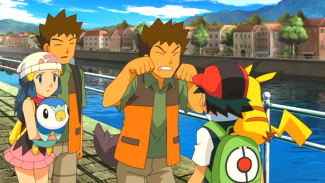 In the movie, Kohdai retreats to the arena where the actual Pokemon Baccers games are set to take place. As he climbs the stairs to the seating area, Zorro'ark's powers give Kohdai the illusion that he's on top of his flying boat. 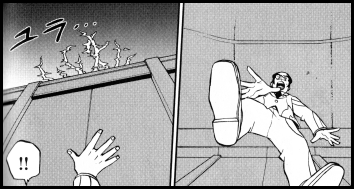 A panicky Kohdai falls forward, tripping onto the field below. Later in the movie, Kohdai wakes up to the sound of his own voice. He finds out that Kurt had recorded him saying all these incriminating things during the movie's climax and realizes that he's done for. During the movie's end credits, we see a news report showing both Kohdai and Goon being arrested. In the comics, Kohdai's fate is a little more uncertain. He climbs the stairs of the arena, just like he does in the movie. The illusion Zorro'ark shows him is a bit different, however; in the comic, Kohdai sees vines. As Kohdai runs to escape the vines from suffocating him, he falls onto the arena. And then...that's it. We don't see any more of Kohdai after that, so we don't know what actually happens. Was he arrested like he was in the movie? Did the fall kill him? Did the people of Crown City find out that he was the one behind all that trouble that occurred all those years before? The comic doesn't really provide any answers, so all we can do is speculate.